a note from apple seeds: A great Saturday afternoon activity for your whole family. Join us! A great Saturday afternoon activity for your whole family. Join us! apple seeds is a PROUD and devoted supporter of Cookies for Kids’ Cancer. We will shout from the rooftops anything Cookies is involved in or attached to…because every nanosecond of every single day they are working to save the lives of children battling cancer. How do they do that? They raise money all year long and use it to help to fund research to develop new and improved treatments for childhood cancers being worked on at the top 5 pediatric cancer hospitals in the country. How do they raise that money? Through bake sales, 5ks, dodgeball tournaments and a couple of high caliber events that knock it out of the park in terms of quality + fun = major fundraising. Here is one of those events we are thrilled to tell you about because it is perfect for apple seeds families. Family Fun Day is one of the best events we have ever been to with our kids. The quality of activities and COOKIES cannot be beat. You and your kids play & eat cookies – and you get to help save lives. 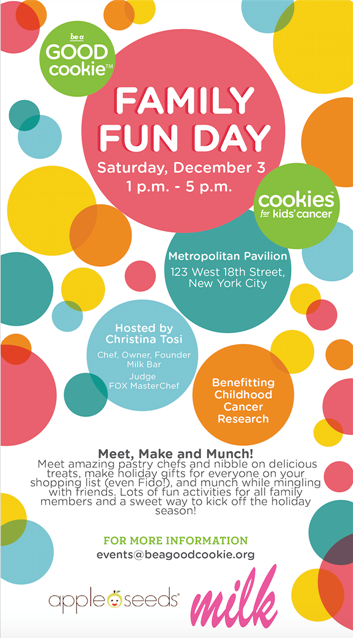 Come hang out with Christina Tosi - Chef, Owner & Founder of Milk Bar and Judge on FOX MasterChef and meet some of the city's most talented pastry chefs, make holiday gifts and munch while mingling with friends. You'll leave with a bag full of gifts ready to spread holiday cheer.